Dimensões desta antevisão: 335 × 599 píxeis. Outras resoluções: 134 × 240 píxeis | 630 × 1 127 píxeis. 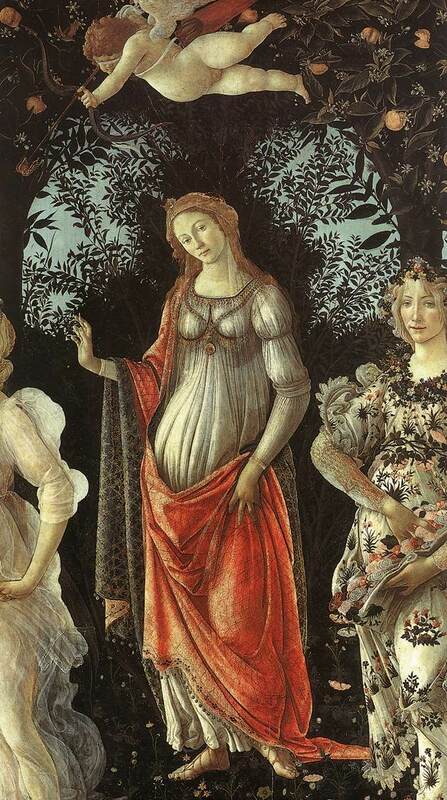 The divine spring garden, in which hundreds of species of plants and flowers are growing, nearly all of which flower in April and May, is being looked after by Venus, the goddess of love. Behind her is a myrtle tree, one of her symbols. She is raising her hand in greeting and welcoming the observer to her kingdom. Overhead, her son, Amor, his eyes blindfolded, is shooting his arrows of love.